The program is a joy to use for both EUMETCast and Internet data - Douglas Deans. What is the HDF Viewer? The HDF Viewer is a Windows program which visualises the HDF data from the Land Surface Analysis (LSA) Satellite Application Facility (SAF) LSA-SAF broadcast over EUMETCast or over FTP from the LSA-SAF Web site. You can visit the self-help MSG-1 group to talk with other LSA-SAF users. You can use the program interactively, or as part of a hands-free procedure to process the data completely automatically. What data format does it read? LSA-SAF data available from the EUMETCast system (as used for Meteosat-8/9 reception). This data covers Europe, North and South Africa, and South America. LSA-SAF data available over FTP from the LSA-SAF Web site. LSA-SAF down-welling fluxes and surface temperatures. LSA-SAF Albedo (various channels and wavebands) and snow-cover data. LSA-SAF Vegetation products (vegetation cover, leaf area index, absorbed photosynthetic active radiation, evapotranspiration). Please note that the files from EUMETCast are sent in a BZ2 compressed format to reduce the bandwidth requirement. If you use my MSG Data Manager software, this can automatically unzip the data for you. The HDF Viewer will automatically unzip BZ2 data on-the-fly, otherwise you can use a BZ2 unzip program. 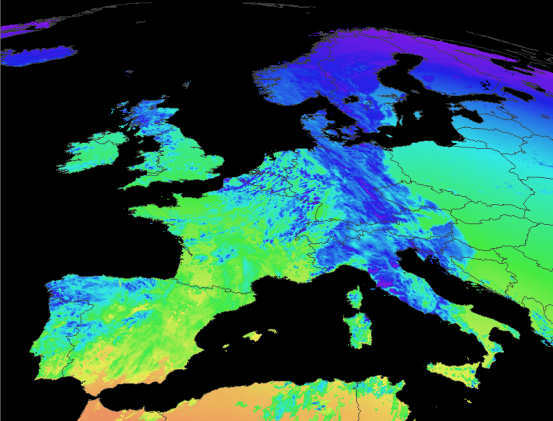 The data is free from EUMETSAT and is delivered over the same EUMETCast system used for Meteosat-8 data. You may need to make one small change to your recv-channels.ini file to enable data reception. Please note that editing the recv-channels.ini on a live system may cause a momentary break in the data. If you have then entry [*] for the channels to receive you need make no change. The notes below are only a guide - your particular recv-channels.ini may differ. Note that this is not the recv.ini file! Please consult your system vendor before making any changes! Please do not send me questions about this - please either ask the person who supplied your TelliCast software (e.g. EUMETSAT), or ask on the self-help MSG-1 group. You may not need these! In the MSG Data Manager, on the Setup, MDD/SAF tab, be sure to check the Land Surface - LSA checkbox, and to check the Unzip SAF files checkbox. Please consult the LSA-SAF Web site for details of registering for the data over FTP which includes North and South Africa and South America data in addition to the European data broadcast over EUMETCast. Here are some reduced-size screen shots from the program. 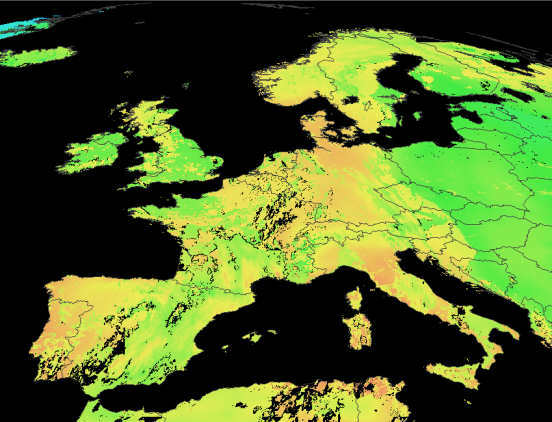 There are three products currently available, the land surface temperature and two down-welling flux estimates - one for short wavelength radiation (0.3�m-4.0�m) and anther for long wavelength radiation (thermal infra-red). More about the data. A licence code is required for this software, after the 30-day trial period. Suggestions for future developments are welcome. V1.4.2 Accept files dropped from Explorer to open them, add optional timestamp to images, correct missing files from multiple data sets. V1.4.4 Add support for ET (Evapotranspiration) data, on BZ2 decompress error, exit with error-level in batch mode. V1.4.6 Support Fire Risk Map (FRM) data, start Land Cover (LANDCOV) support (includes colour palette and mouse-over descriptions, HDF5 cache=0 accepted with reluctance), add ASCII output for more data types, add image "snapshot" of selected region in ASCII mode (SNAPSHOT2 and SNAPSHOT4 alternatives provide 2x and 4x zoom), accept MapGen and GSHHS 2.2 boundary data, add support for local boundary data which is specified by the environment variable BOUNDARY_DATA, environment variable BOUNDARY_COLOUR can define the boundary colour (limited to grey shades currently). V2.0.2 Higher precision readout if Ctrl is pressed. No longer hardware locked to a single PC. Note that a new licence key is required for this version. If you don't already have a HDF Viewer 2 key, existing users can upgrade here. Please state HDF Viewer in the "What product are you upgrading?" box.